The circuiteer. A series of distance maps for all the principal towns in the united Kingdom. 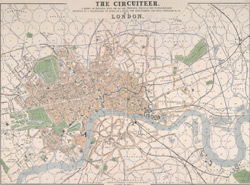 Invented by J. Friederichs, to serve as a guide for ascertaining cab fares, porterage &c. &c.
bl.uk > Online Gallery Home	> Online exhibitions	> Crace Collection of Maps of London	> The circuiteer. A series of distance maps for all the principal towns in the united Kingdom. Invented by J. Friederichs, to serve as a guide for ascertaining cab fares, porterage &c. &c.
Map scale description: 3'' : 1 m.
The title of this map of Victorian London appears at top centre, with a scale bar at the foot of the plate. The map is divided into circles, each a half-mile in diameter, allowing the reader to ascertain the distance between two places at a glance. Each circle is also numbered for reference, with a key to the principal streets and squares a in panel below the map, together with an explanatory note. Repeated in French and German, this note reports London cab fares, set by Act of Parliament at 8d (pence) per mile and 4d for every additional half mile.